Into the city today – things to do! 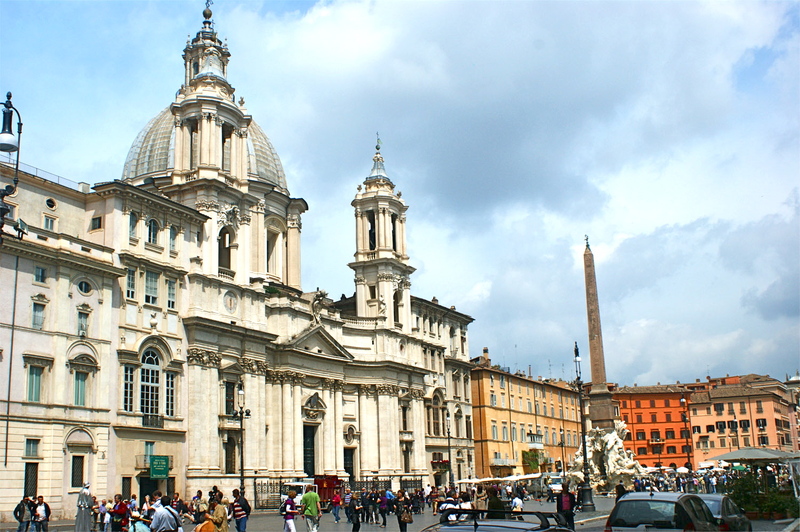 We take a bus, and find our way to Piazza Navona. Maggie would be expecting me to bring something home and, following on from our chats with an artist at the Trinità dei Monti yesterday, I have decided to seek out some works of art. I know she will appreciate that, as she herself likes painting, and when we were in Rome back in 1997 she too liked Piazza Navona. For some reason all, or the vast majority of, the artists are at the northern end of the piazza. This leaves the area south of the Fountain of the Four Rivers free for others, such as our still life people. They are there, and I am sure the mummy has not moved an inch since Friday! 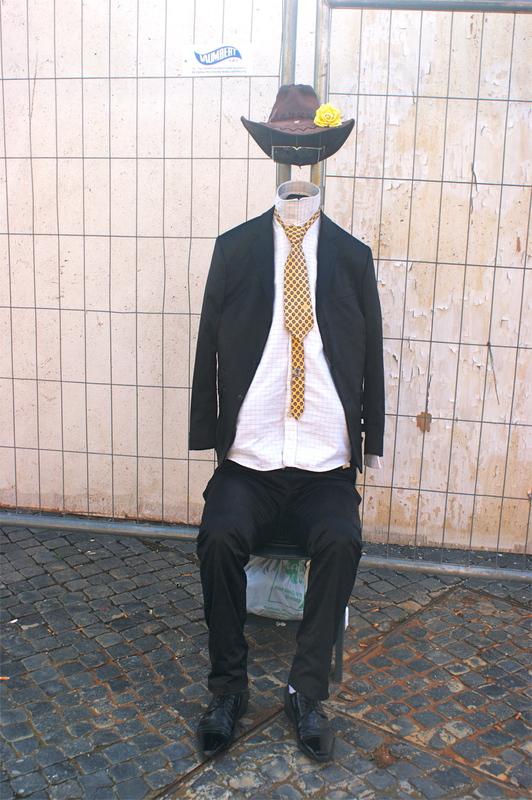 The headless one is sitting by a lamppost today; Rick espied it but I had not noticed. This time there is someone being a tree, or at least the branches of one. They are so clever and must have supernatural muscle control. I take the opportunity to take photos of the individual characters that represent the four rivers – Ganges, Nile, Danube and de la Plata. The one representing the Nile has an arm shielding his face; this is said to indicate that although it was known that the Nile existed, its source had yet to be discovered. Another story has it that the sculptor Gian Lorenzo Bernini deliberately cast Danube in such a way so as to show his disgust at Sant’Agnese in Agone, the church that sits halfway down the western side, the façade of which was the work of one of Bernini’s greatest foes, Francesco Borromini. I have always thought that suggestion somewhat odd, as Nile does not actually face the church! We then turned our attention to finding something that I could take home. It was so difficult, though, for all the artists are so, so talented. Some works I discounted, as I knew Maggie would not like them – too MUCH use of colours. However, I came across some that I really liked, and knew that Maggie would too. The lady had both originals and reproductions, and as the repros were brilliant and cost quite a bit less I bought a couple, one in sepia of Piazza Navona, the other in colour of the Spanish Steps. Moving on we encountered another lady, who spoke in an unmistakably Scottish accent, despite having lived in Italy for 37 years. She was a Scottish-Italian, who had lived the first twenty-one years of her life in Scotland and was always considered Italian; moving to Italy, even after 37 years she was still considered by some to be Scottish!! Anyway I bought another couple of repros from her. That made a total of eighty euros, which I felt was sufficient. If I could have paid by credit card I may have stretched to buying the originals. 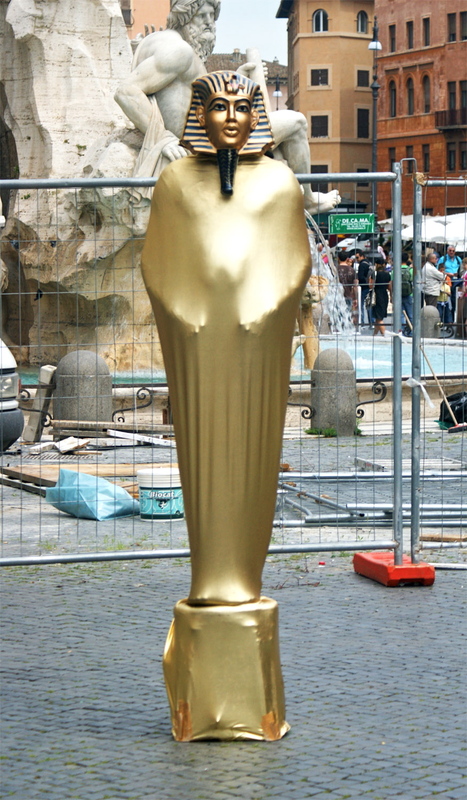 From Navona we walked through to Sant’Eustachio, and another of their fabulous coffees, then on to Campo de’ Fiori. This time we saw the market in full swing. What a great atmosphere! And the produce! 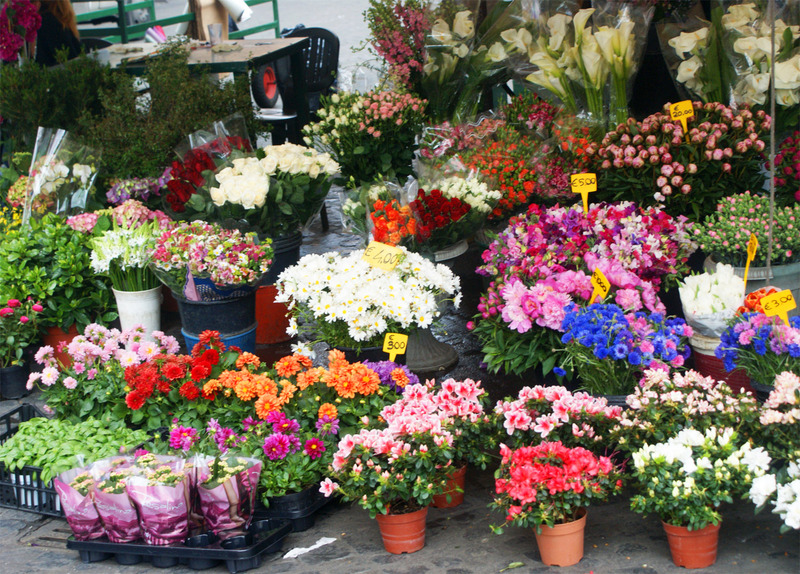 Hopefully the photos that I took have done justice to it, just as they have hopefully done to the flower stalls. 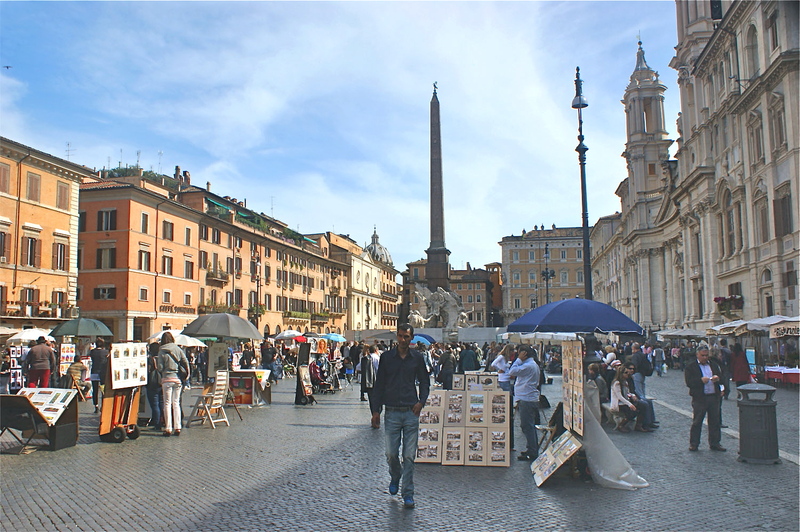 We then retraced our steps, skirting the southern end of Navona and walked on through to Piazza della Rotunda, and on to Piazza Montecittorio. I had to take a photo of the Albergo Nazionale, for that was where Maggie and I had stayed back in 1997. There was time also for photos of the Parliament building and the Marcus Aurelius column, before crossing the Via del Corso and arriving at Piazza di Trevi. Cue yet more photos, hoping they would look better than those I had taken thirteen years previously when the air was so bright the fountain was too dazzling. 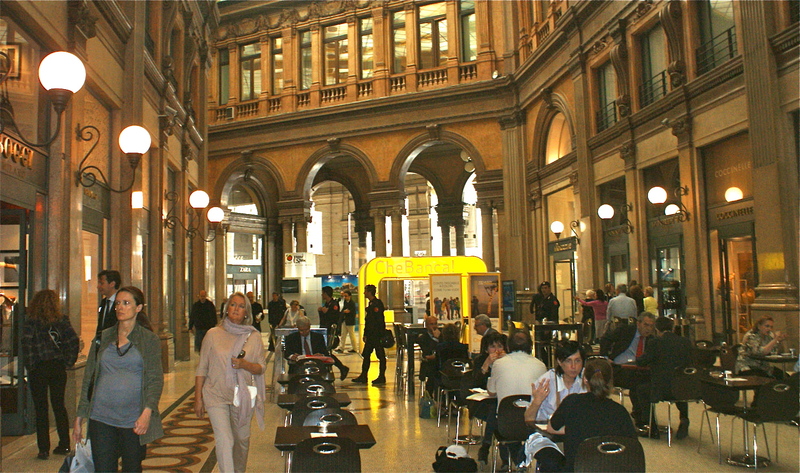 From Trevi we found our way to the Galleria Alberto Sordi for a coffee and a quick bite to eat. It is quite a place, this galleria, with modern fashion shops in an antique environment. Then we look for a bus to take us to Trimani; I mean I could not NOT go home without some wine. The two chaps at Trimani were very helpful, and advised on which wines to go for. I ended up with just four bottles – any more and I think the case would have been too heavy. From Trimani we returned to the apartment for a well-earned rest before we headed out for final evening meal. Just as Rick had shown me where to get some good views of the city from Piazza Napoleone I, so he knew there would be some equally good ones from the top of the Janiculum Hill. To get there meant a taxi ride of some distance. Rick was absolutely right; there were fantastic views. The great shame was that the weather was appalling and there was simply no light, so taking photos was out of the question. Having had our fill of the views, we walked on down into Trastevere. Rick had spoken quite eloquently of this area of Rome, so I was intrigued. It is indeed a very interesting area, with its maze of narrow streets, restaurants, bars and so on, an area that would be a must to visit another time when, hopefully, the weather would be kinder. After some time walking around the area we arrived at the restaurant that Rick knew, Mo’ Sto (http://www.tavernamosto.com/home.html). And so it was that I had my last meal in Rome in yet another excellent restaurant, full of atmosphere, good service, a smile on people’s faces. I had a fillet steak, which by Italian standards was slightly overcooked, ie it was not blue!! It was superb, so tender and tasty. And washed down with another brilliant wine it made for a great end to my stay in the Eternal City. After a walk round Trastevere it was time for a taxi back to the apartment. Rick said he would go into the office in the morning, allowing me to pack and get myself ready at my leisure. This I did and, remembering the keys to the apartment, left to find a taxi. The case felt like a ton weight and it was not easy dragging it along, and I dragged it along for a long time because for some reason I missed the taxi rank!! Duh!! I had to retrace my steps, and asked for directions to Piazza Buenos Aires a couple of times. Eventually I got a cab and asked for Termini. I was well in time to meet Rick for lunch, having more than enough time to join an interminably long queue for a train ticket. Rick arrived and we found a restaurant in the forecourt of the station. We chatted about this and that for quite some time. It was clear that Rick was not happy though, and with good reason; he had been told that he had to move to the company’s headquarters in Dublin. I was so sad for him; he had really found his feet in Rome, and now he was faced with Dublin and an uncertain future with the company. We parted company by the train and very soon I was on my way back to Fiumicino. I checked in and was told that there was a delay in the flight. I had to go to the satellite (gates G), where I phoned Rick and asked him to contact Maggie and tell her that I would be a little late arriving. Eventually, though, we took off, and made good time getting back to Gatwick, enough time though to do another six sudokus. Peter, my brother-in-law, was there to greet me and take me home, via a fish and chip shop (from the sublime to the ridiculous one could say). It was good to be back. I got out the paintings and Maggie chose the one of Piazza Navona, so I gave the one of the Spanish Steps to her sister Marianne. And of course there was a bottle of wine for Peter. And of course there are so many fantastic memories of a truly memorable week. It would perhaps be invidious to single out any from the time in Rome, but of course for me the real highlight was meeting the Gianfrancesco family in Baia, and feeling the very real warmth of their welcome and hospitality. I do hope that one day I will be able to return. However, with our situation one never really knows and we never look too far into the future. I am grateful for having had the experiences, and they will remain with me. Having said that I did not sleep too well Sunday night – maybe I had overdosed on the coffee! Anyway, I slept late and we spent the rest of the morning chatting. We went out for lunch, finding a nice little, unpretentious place, where I had a super fried sardine dish washed down with a nice white wine. Rick decided to pop into the office in the afternoon while I chilled out at the apartment. By the time Rick got back it was early evening; after a while we went out to find a place to eat. Rick had one place in mind – Trimani. Trimani must be one of the largest wine shops not just in Rome, but also in Italy. They have an estimated 4,500 bottles of wine there! 4,500!! Not just Italian, but French, Spanish and other wines as well. Round the corner from the shop is the entrance to the restaurant, on Via Cernaia (for a review see: http://www.restaurantsomh.com/r40.htm.). Here we had a very pleasant dinner and I started feeling a tad better. Although we had taken a taxi there, there was a short route back to the apartment that took us only 20 to 25 minutes. I slept a lot better Monday night and was ready to hit the town! But first we went down the road from Rick’s apartment to the area called Coppedé, after an architect of the early twentieth century. 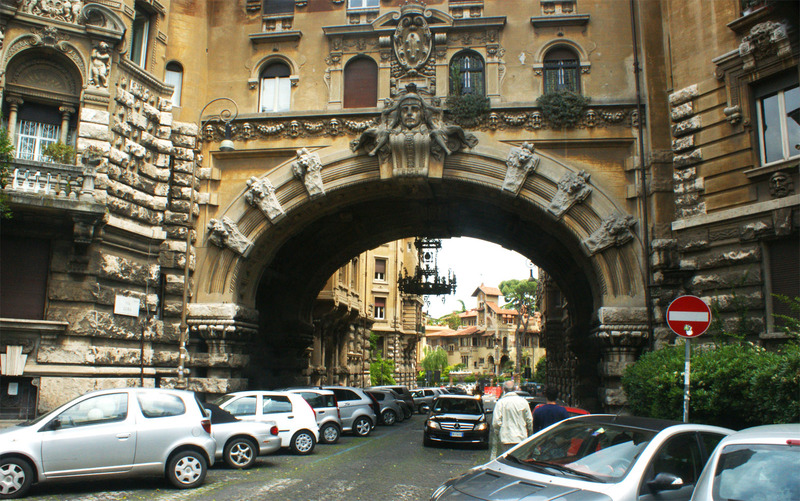 The entry to Coppedé is through a great archway that leads into Piazza Mincio. 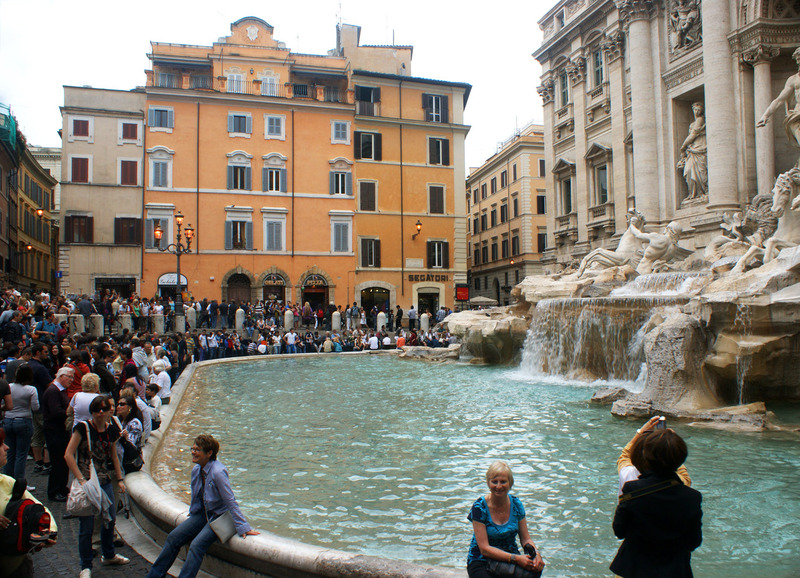 In the centre of the piazza is a fountain, dedicated to a frog! However, the thing about Coppedé is, unsurprisingly, the architecture. All the buildings are different, and exemplify different styles, from the baroque to what was then ultra-modern. Somehow, though, the buildings co-exist quite happily. 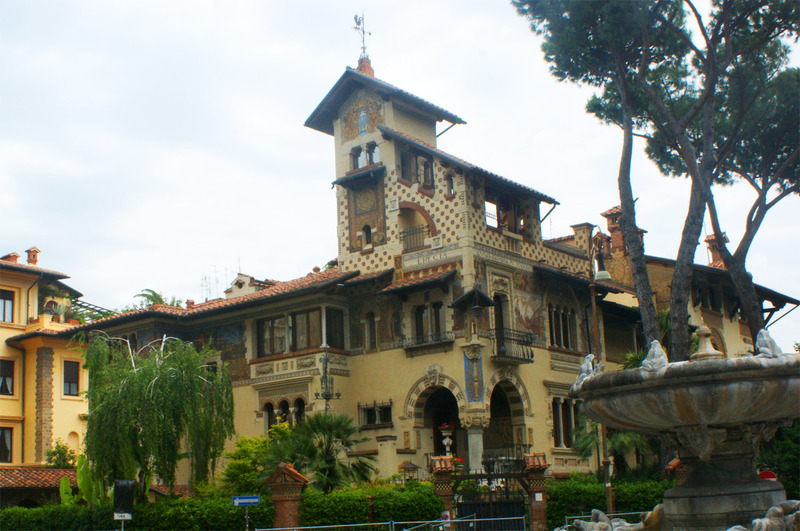 An interesting little place is Coppedé and Piazza Mincio. From there we walked to the Borghese Gardens and gradually wended our way down towards the Galleria Nazionale dell’Arte Moderna. There are so many things of interest to see in the gardens, such as the Papal monument (one of the Borghese family had been a Pope), various statues, one of which was headless but had insisted on carrying what I presume was its head under its arm – although I would not have been seen dead with such an ugly head as that! Then there is the Temple of Diana, without Diana, just an empty plinth; how long has it been like that, I wondered. 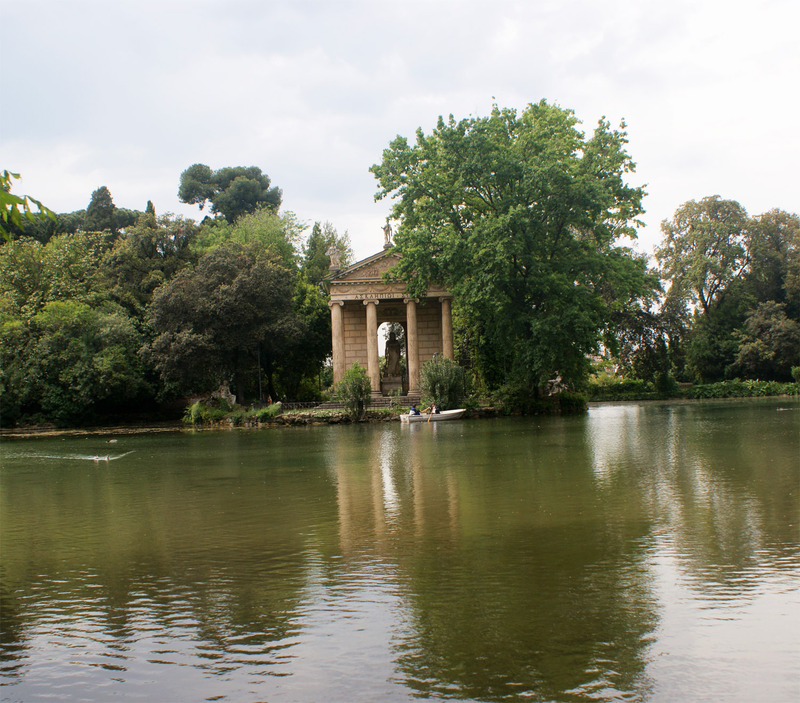 One of the nicest places, however, is the small boating lake, with the Temple of Esculapio, a scene of such serene tranquility. 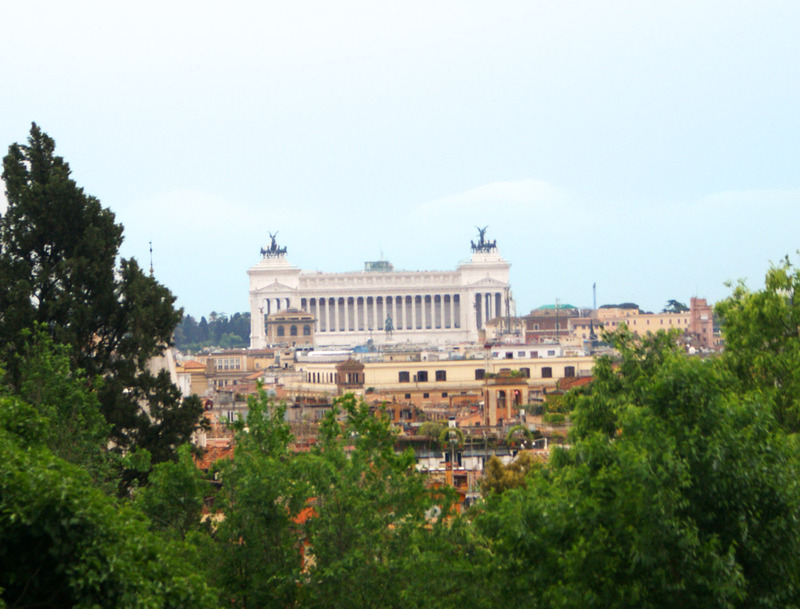 There is much to see and admire in the Borghese Gardens. 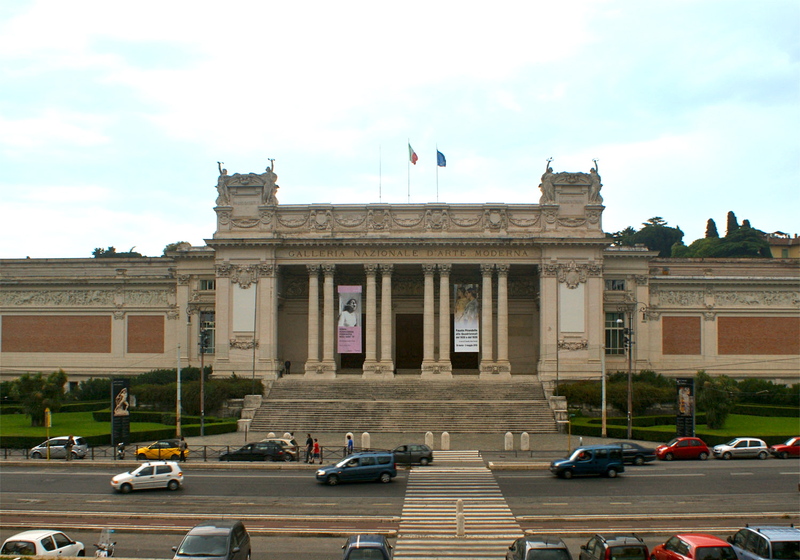 From the National Gallery it does not take long to reach the road that leads down to Piazza del Popolo. As the weather was not good – it was raining – we found a café in the entrance to the piazza and had an American coffee each. As the rain did not seem to want to go away, Rick bought an umbrella; I refused to after some idiot chased after me trying to sell one to me – I mean, chased me, for God’s sake, what was that about? 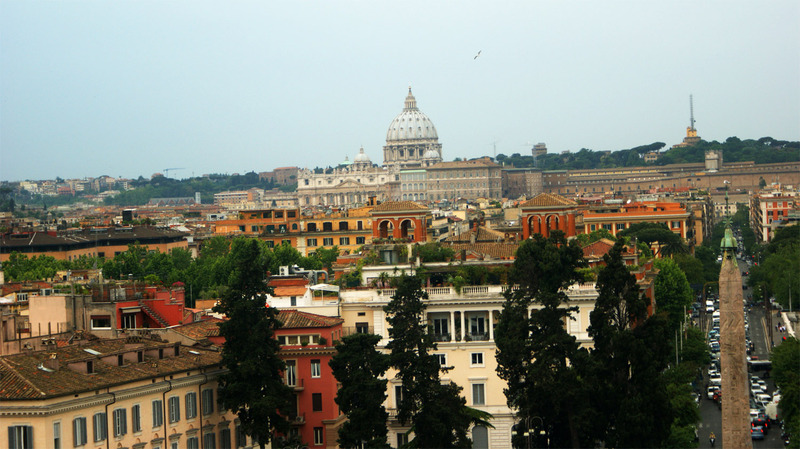 Rick knew where there were great views of the city and led me up the steps from Piazza del Popolo to Piazza Napoleone I. From here one can see across to St Peter’s and also the monument to Victor Emanuelle II, among other views. It was a pity the weather was not better. From Napoleone I it was just a short step to the Trinità dei Monti and the Spanish Steps. In front of the Trinità there were a number of artists showing their wares, so we had a chat with one of them to gauge what sort of prices they were seeking. We then went down the Steps, me taking photos despite the rain, until we got down to La Barcaccia, the leaking boat shaped fountain in Piazza Spagna. It really was not nice enough to hang around so we found a taxi and went back to the apartment. In the evening we got a taxi to Via Veneto. We were a little early to find a restaurant so walked up to the end of the Veneto crossed the road to where the world-famous Harry’s Bar is, then walked back down the road to the Gran Caffé Dolce Vita. As you may have guessed this was an integral scene from La Dolce Vita. We stopped off here for an aperitivo – a stupendous glass of red wine!! Then it was onwards until we found a restaurant called Ciao Bella. We decided to eat here. Again the food was brilliant and Rick, unbeknownst to me ordered a half-bottle of Brunello di Montalcino. Oh my! That actually cost almost 50% of the total cost of the meal. It was a very relaxed place in which to eat, with excellent service by the waiters, and we talked about various things, not least the important influence that Lindsey Buckingham and Stevie Nicks had on the music of Fleetwood Mac. Then it was back to the apartment to complete another lovely day. Today we travelled down to Campania, to meet Lorenza and her family – her son, Gabriel, and Anna Rita and Tiziana, two of her sisters. Rick spent a bit of time Friday evening online hiring a car, so we collected it – a 6-gear affair the size of a boat! – and gradually wended our way out of Rome. Thank the Lord for GPS! Eventually we got on to the autostrada, and started the journey in earnest. Like motorways everywhere the autostrade are the ultimate in boring. On and on we went for the better part of two hours, maybe a little less, until Rick suggested we contact Lorenza to arrange to meet at Caianella, a small place just off the autostrada from where she would lead us to Baia. And what a meeting it was! Lorenza greeted me as if we had not seen each other for centuries. For sure, the warmth of her greeting made this old’un most happy! 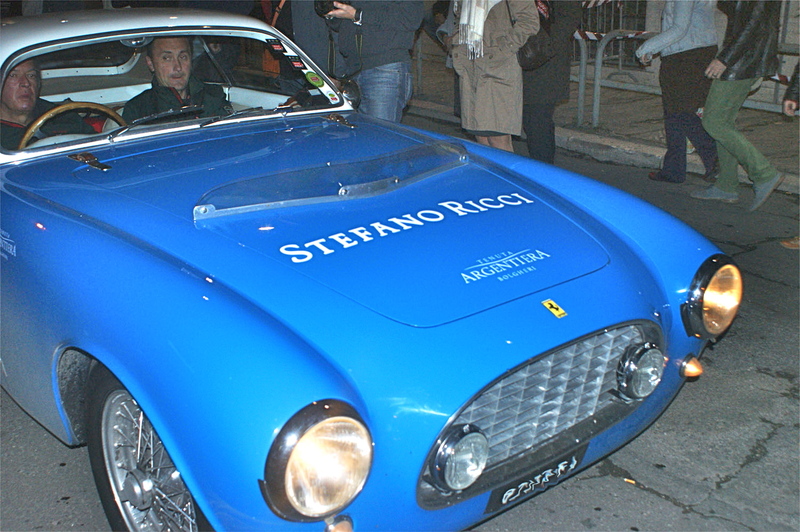 Then it was back in the cars and onwards to Baia. The village is situated in a very rural location and reminded me of some of the villages in the Horsham area; certainly it was a place I would have liked to have been able to explore, but it simply was not possible. 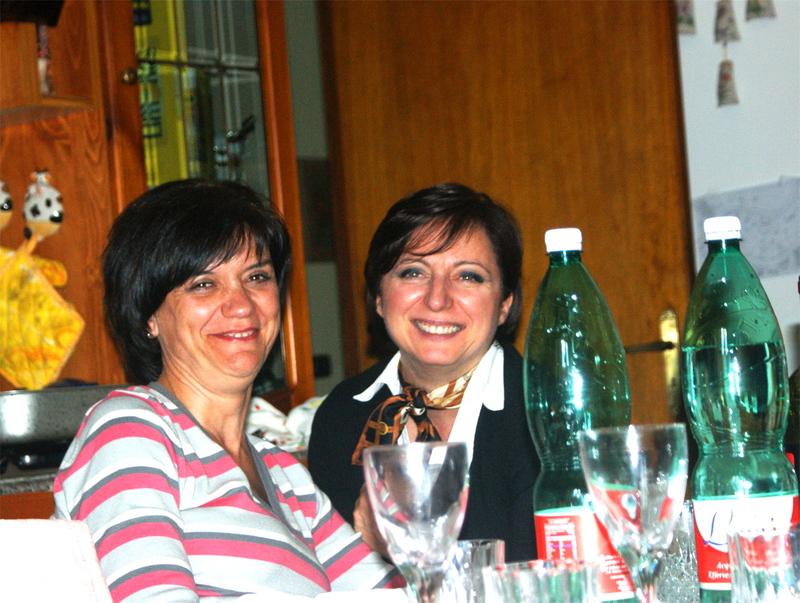 When we arrived Lorenza introduced me to her sisters and also to Loredana, a family friend. A little later, Luigi, Tiziana’s fiancé, arrived and we sat down for dinner… and I mean dinner, for it could not ever be considered lunch!! First, there was pasta, and plenty of it, then veal with mixed vegetables, washed down by glasses of both local red and white wines. 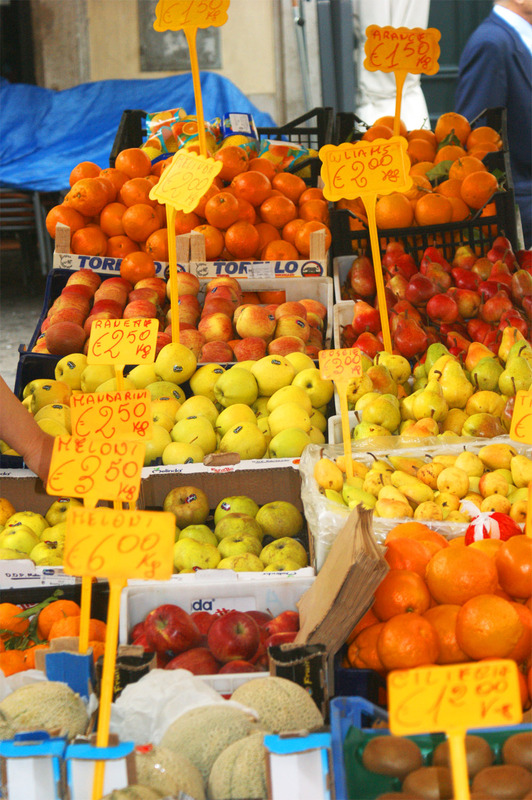 All the produce was local, which is how things should be – if only they were here, but then fat chance! We spent some time chatting; there was a lot of catching up to do after not having seen Lorenza for at least two years. It was then decided that we would go to Caserta, where we had coffee at the Gran Caffé Margherita on Piazza Dante Alighieri. The passeggiata was just starting so it was a good place from which to people-watch. We then joined the passeggiata and strolled round the centre of Caserta. It seemed like any other Italian town, with life going on as normal. I say this because I know it is a camorran stronghold, where the appalling camorristi hold sway. 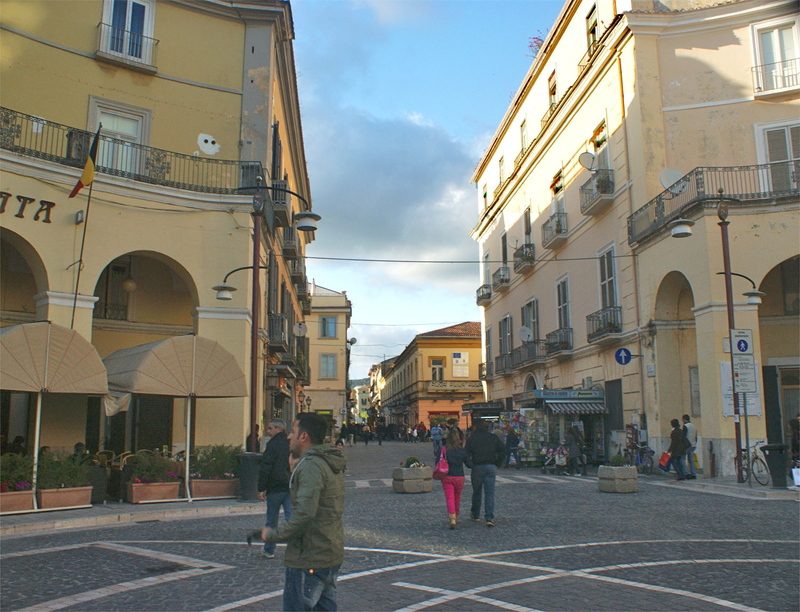 Caserta impressed me as an elegant town, particularly the area around the Corso Trieste. 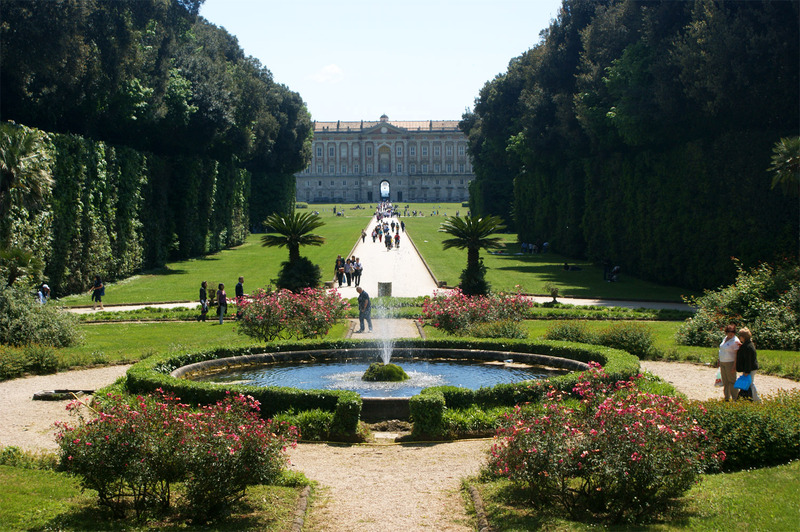 Then, of course, there is La Reggia, the Bourbon Royal Palace, with the Royal Park, of which more later. We walked through the courtyard of the Palace, up to where the gates to the Park were closed. La Reggia is huge. I mean, next to it, Buckingham Palace would be dwarfed. Lorenza said that there were 365 rooms in the building, one for each day of the year. I can believe it, and honestly thought that there would have been even more than that. 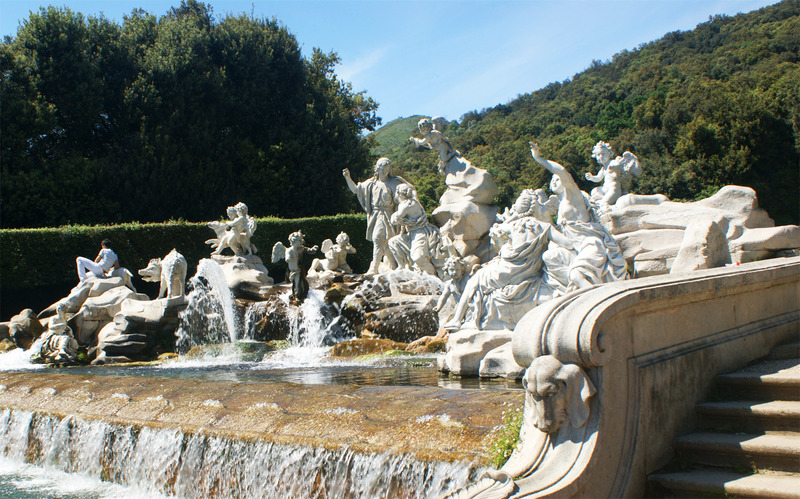 Unsurprisingly, there is information about it on Wikipedia, at http://en.wikipedia.org/wiki/Palace_of_Caserta. We then walked back through the courtyard and then to the car park. Too soon, as ever, the time had come to say goodbye. Like all such nice days it did not seem long enough. Certainly I would jump at the chance to revisit that area, to see more of the village, in particular the church of which Lorenza spoke so eloquently. 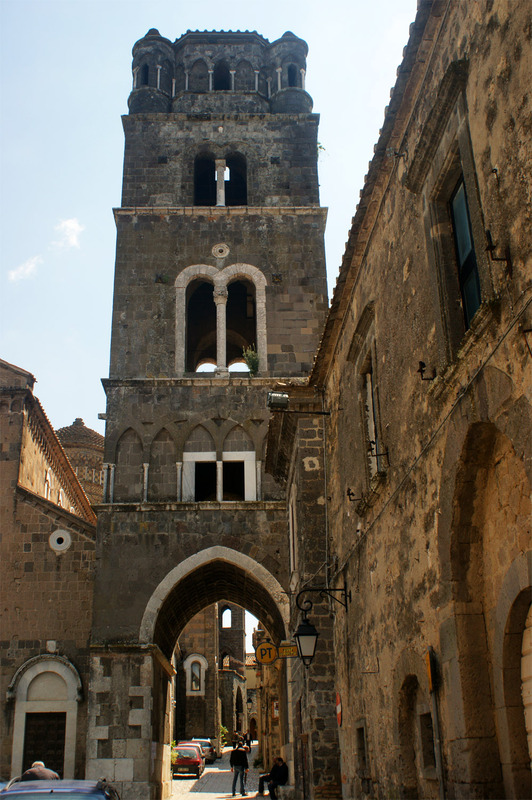 What is it about Italian churches, large or small? They all seem so interesting. We had booked the night at a b&b, called MontAlbano (not to be confused with Salvo Montalbano, Andrea Camilleri’s marvellous fictional detective), which was on the extreme outskirts of Caserta. It took a bit of finding, as it did not advertise itself, but eventually we arrived. The couple that run it are absolutely charming; the man is a painter and the wife works on ceramics, and both are obviously very talented. They explained that the name MontAlbano was an amalgam of their own surnames. Once we had dropped our bags and had a wee chat, the man suggested we find a bar. “Fine”, we said; “Follow me”, said he. So we did, not expecting to be following him for the next ten minutes or so, until we reached a junction. Here, the chap turned left, in front of a very long procession of traffic, as a result of which we lost him. He had not pulled up at some place that would have been visible, so not seeing him, we decided to return to our room. Oh, boy! What fun we had as we drove round in ever-decreasing circles trying to find the street where MontAlbano is!! Eventually, we stopped and asked some guys at a bar. They were somewhat disbelieving. “No, there is no such place,” Rick was told. He got back in the car and as we drove forward, I said: “I remember this road; we take a turning on the left.” So, we eventually got back to our room. 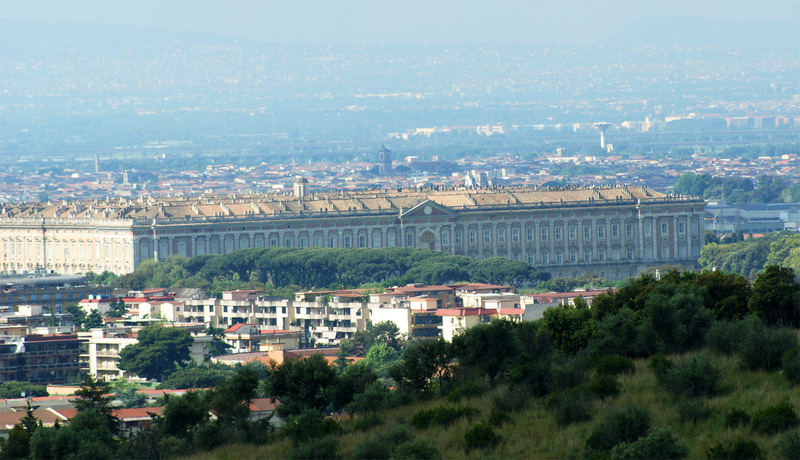 We arose to a marvellous morning, and had breakfast on the balcony from where there were fantastic views overlooking Caserta, with La Reggia dominating everything around it, and also in the general direction of Naples. It was so nice and relaxing there, having a good breakfast with really nice coffee. It made for a good start to the day. We had talked about going on down to the Amalfi Coast, but agreed it was too far. 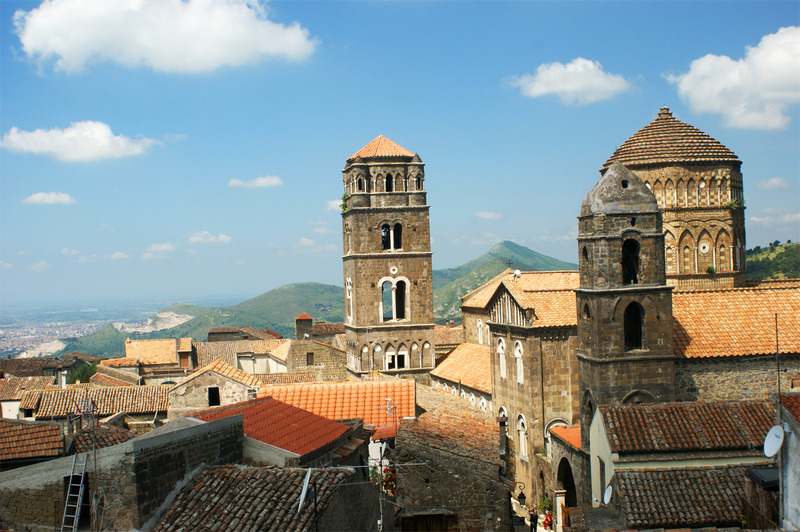 So, we spent the morning wandering around Casertavecchia (Old Caserta), which was very interesting, with its narrow streets, amazing views and the ruins, which I believe are Norman. It is, without doubt, an ideal place to take loads of photos. 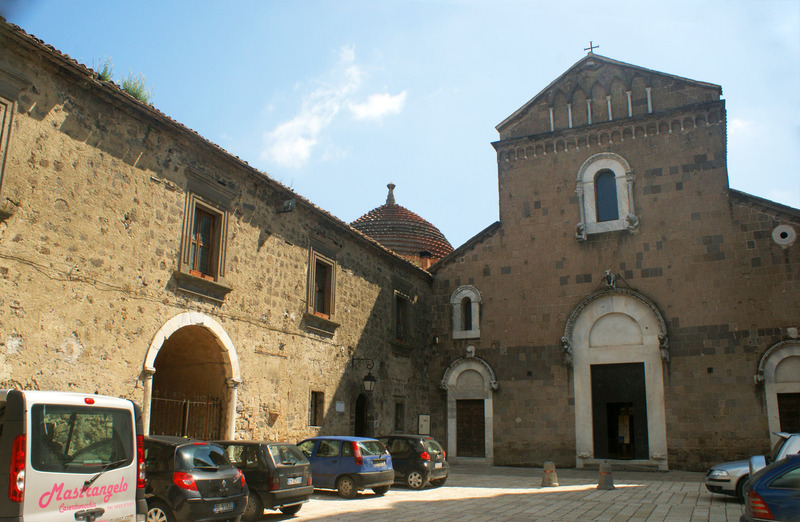 There is a central square, Piazza del Duomo, the church named for St Michael the Archangel. The ruins reminded me of Pevensey Castle down in East Sussex, seeming to be of the same age. 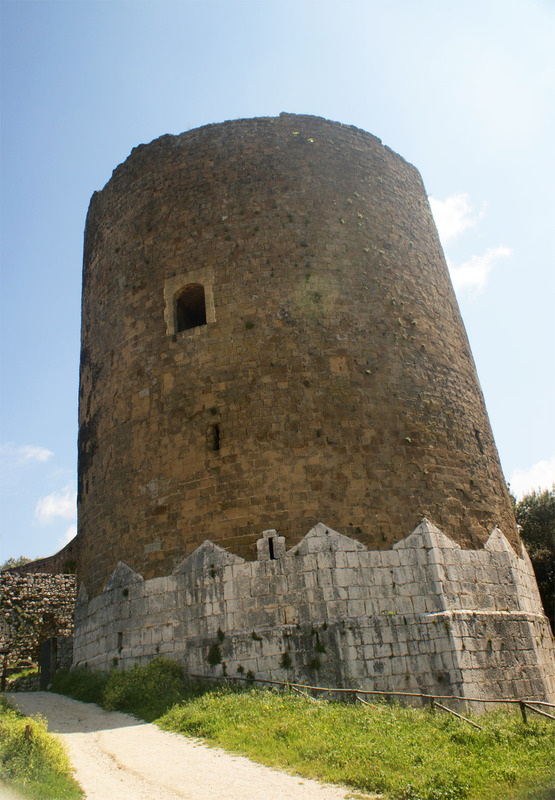 There is a tower at the entrance, a main building and the remains of what may well have been another tower. 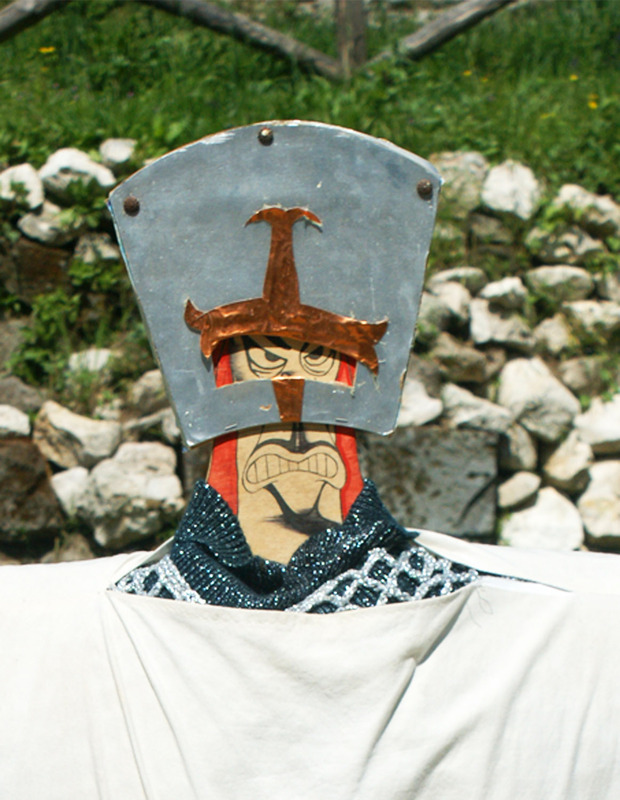 Curiously, there was a caricature of a Crusader outside the main building. There was another Crusader, together with a knight in armour in the building, which was used as a sort of historical museum. There were some explanatory signs dotted around the place, one of which described the scenes in Pier Paolo Pasolini’s film, Il Decameron. 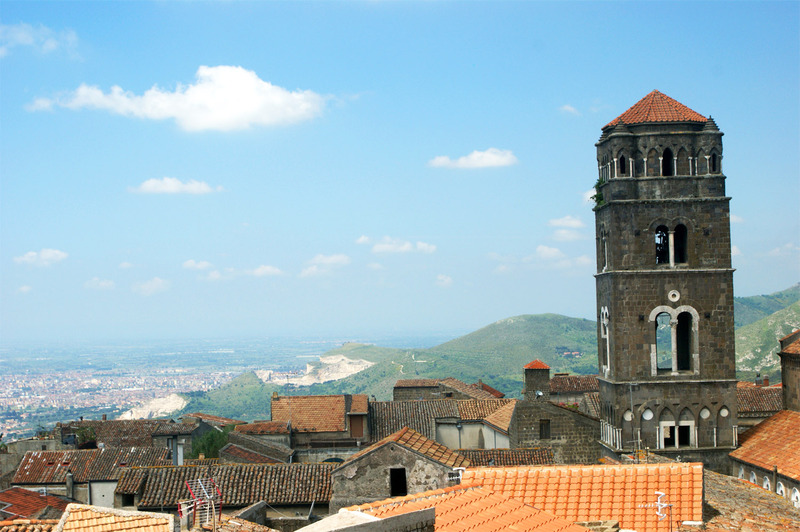 Another described the history of Casertavecchia, Caserta’s original name (Casa hirta) and what it meant – house on a very steep slope. 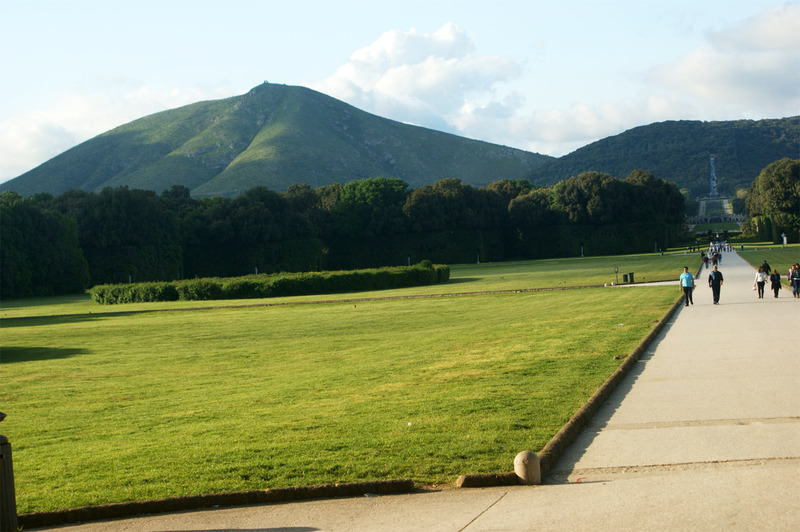 Having had our fill of this interesting little place we decided to go into Caserta, grab a quick bite to eat and explore the Royal Park of La Reggia in the afternoon. The quick bite to eat was without any doubt the worst meal (for want of a better word) that we had all week. The place was the equivalent of an English ‘greasy spoon’, but when you are hungry I guess anything goes! And so on to the Royal Park of La Reggia. What a place the Park is. Designed by Luigi Vanvitelli on the orders of Charles of Bourbon, it would have been even more ornate – indeed overly so – if it had not been for the fact that Charles went off to be King Charles III of Spain. Once through the courtyard, you effectively walk in a dead straight line for something approaching a mile before reaching La Grande Cascata (the Great Waterfall), which is visible all the way along. You can take a pony and trap or a ‘quadricycle’, however, for an additional cost. 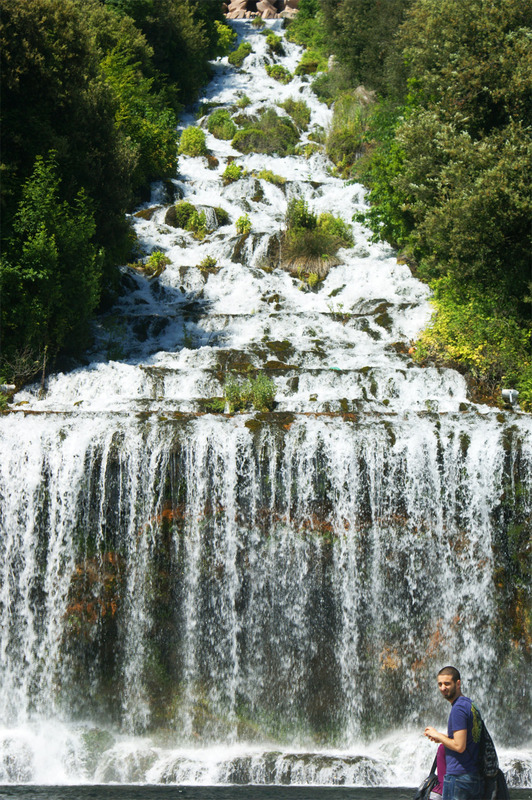 Before reaching the waterfall, there are a number of fountains to grab your attention. The first one you reach is the simplest and is named for Queen Margherita. I think its sheer simplicity makes it the most appealing of them all. 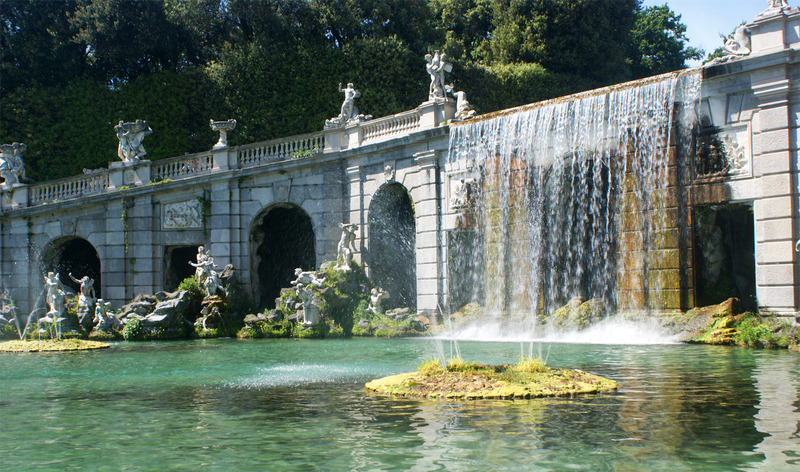 As is the case with all the fountains, you can look back towards the Palace. 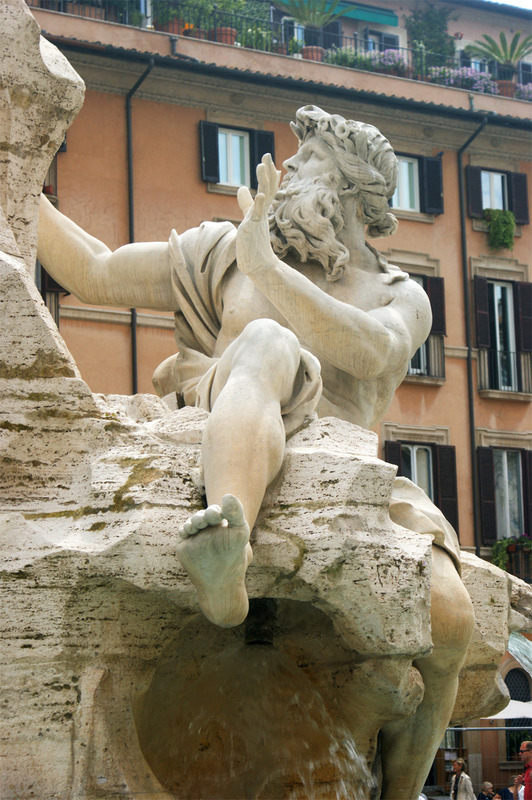 The next fountain is named for Aeolus (Eolo in Italian), and like the rest of the fountains stretches across the aquallerate. Like the others, it is very ornate and has a basin into which the fountain falls straight down. In the basin there are two matching spray fountains. Next up is the Fountain of Ceres, then that of Venus and Adonis. Again there one can look back towards the Palace, now looking quite small. 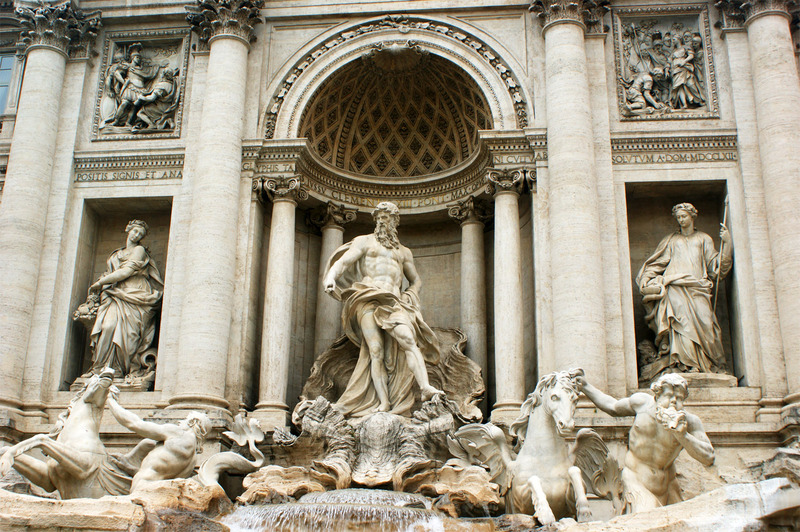 Finally you arrive at the Great Waterfall, with its large basin in which there are the Fountain of Diana and Acteon. Both pieces of statuary, which make up the one whole, are incredible works of art. You really need to be there, as words fail to do the Park justice. From the Waterfall, you can turn right and enter the English Garden. Unfortunately, time was not on our side and we were not able to explore Il Giardino Inglese properly. Certainly, though, if I find myself at La Reggia again, I would want to go straight to the English Garden and take the time to really appreciate it. It was time to leave, and we walked back to the Palace somewhat more quickly, mainly because I stopped only once or twice to take photos. 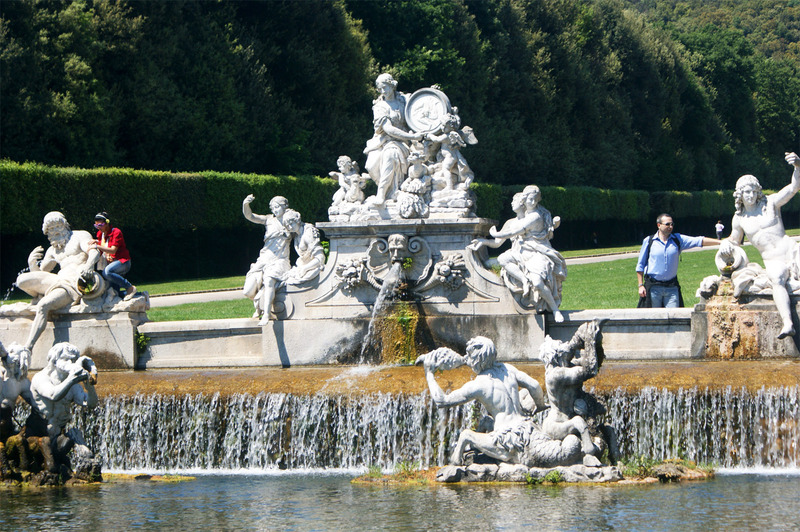 I bought a book about La Reggia, which I found extremely useful in identifying which fountain was which. Then it was back to the car and to start the return trip to Rome. We were back at the apartment about 8.30, by which time I was absolutely ravenous. We rested up for a while and then went out and found one of several Insalata Ricca (http://www.linsalataricca.it/), this one on the Viale Regina Margherita. I decided on a pizza capricciosa, and I don’t believe I have ever had such a thin-crust pizza. It went down well! Rick had one of their insalate ricche, a large bowl of mixed salad. What annoyed me, though, was the waiter coming up every couple of minutes and trying to get us to have other stuff – all of which we declined, although I am not so sure that he did not try to include it all in the final bill. Rick had a little bit of a discussion with the manager when he paid the bill. Not good practice. All in all, however, it had been a wonderful weekend and I was feeling the tension and stress finally receding. It had been 2 and a half years since I last visited Italy, I was in need of a break, to recharge the batteries after what had been not the best of winters. Luckily, my good buddy Rick was living and working in Rome, the Eternal City that I had visited with Maggie thirteen years previously to celebrate my fiftieth birthday. Where had those years gone? 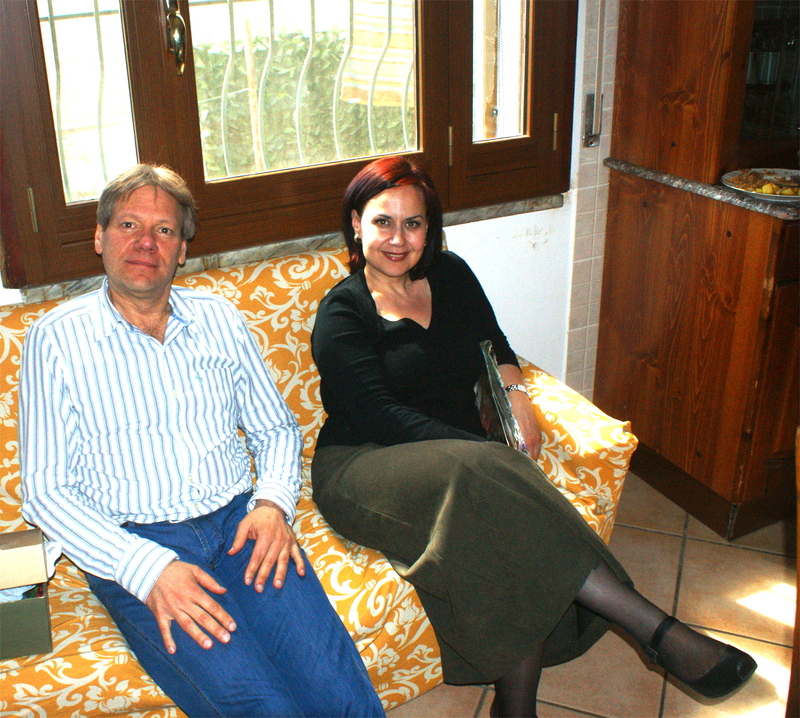 There was also Lorenza, a very dear friend of both Rick and mine, who now lives in Baia e Latina, a small village near the city of Caserta in Campania. So, on Thursday 6 May I boarded a plane for Rome Fiumicino Airport, otherwise known as Leonardo da Vinci. Strangely enough, it was the first time, at the venerable age of 63, that I was doing a trip by myself; sure, the last time in Italy I had returned from Le Marche alone, but I had never done both journeys. Maggie and I had had seven holidays together in Italy, but now that she is disabled with MS, she cannot, and does not want to, fly. The flight out went well. It took about a couple of hours, enough time to do about 6 sudokus! The first thing to do when I got through arrivals was to find the station, so that I could get a train to Termini, where Rick was to meet me. Where was the blasted station? Come to that, where were the signs for it? Oh, good grief. I saw a well-dressed man and asked him where it was. “You see the letter F?” “Yes”, I lied. “You’ll find the station there.” “Grazie!” And sure enough, there it was. I bought a one-way ticket and boarded the train. Relax, man, relax… so I did, I think. It was not the most inspiring of journeys I had taken, and certainly not a patch on the beautiful trip from Ancona to Bologna the last time I travelled by train in Italy. After about three quarters of an hour I am at Termini. What a place! I seem to be walking for years before I find a possible escape route. But first, a coffee, then phone Rick. I order an American coffee and get a single espresso! OK, fine… but it would have been nice if it had tasted like coffee! Rick says he’s on the way but the traffic is against him. Eventually, he turns up and we go and find a taxi to take us to his apartment, which lies a little north of the Villa Borghese, or a little south of Villa Ada, take your pick. We spent a bit of time at the apartment chatting, before venturing out. This was just the start of an enormous amount of walking we were to do during the week. Rick knew a lot of the restaurants that were within reasonable walking distance from the apartment, and after inspecting a few menus we decided to eat at I Butteri (http://www.ibutteri.it/), which means cowboys. The restaurant is situated on the corner of Viale Regina Margherita and Via Alessandria. In fact, the management seem to like the area so much that they have two separate restaurants on each side of the intersection! It is the type of restaurant that I like, in that it caters for the Romans, and people like myself – a tourist – are very rare on the ground. The result is simply fantastic food, and wine to die for. We shared an enormous plate of mixed antipasti and a salad with a chunk of mozzarella – not the little balls of the stuff that you find here, but a man-sized chunk from which we could cut great slices out! Together with a really nice wine it was a good start to the week. After a leisurely breakfast, it was time to hit the city. Where Rick lives is in the Trieste area (or Quartiere), so we had a short walk around the area before taking a bus to close by Piazza del Popolo. As ever, the Piazza was buzzing with life overlooked by the twin churches of Santa Maria in Montesanto and Santa Maria dei Miracoli. They stand on either side of the Via del Corso, which takes you down to Piazza Venezia, the Monument to King Victor Emanuel II, beyond which lies the Foro Romano. But we didn’t want to go there! Instead, after walking a fair way down the Corso, we turned off to the right and wended our way through to the Piazza della Rotunda and the Pantheon. The Pantheon dates back to the first century, and although it is dedicated to Marcus Agrippa his original building was destroyed, so what we see now is its replacement. 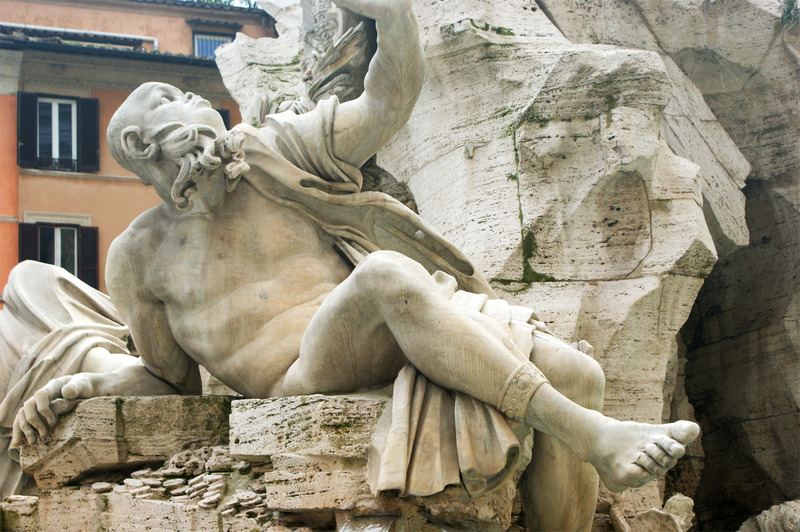 Clearly, it was a place for photos, not just of the Pantheon but also of the fountain that stands in the Piazza. 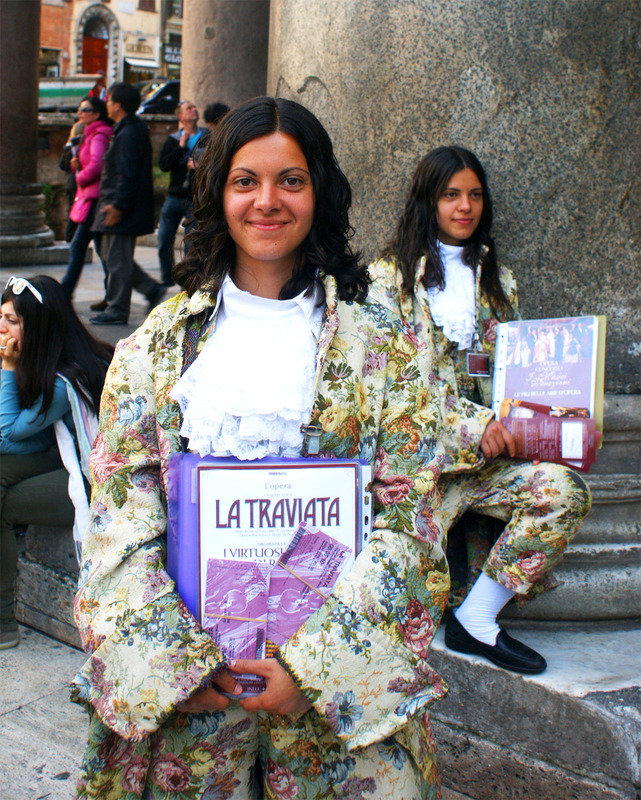 Also there were some young people dressed in what might have been seventeenth century finery advertising La Traviata. One young lady kindly agreed to pose for a photograph. Then it was away to find Rick’s favourite coffee house, Sant’Eustachio (http://www.santeustachioilcaffe.it/). I needed just the one sip of my caffé americano to understand why he liked it so much. They make all their coffee and coffee products themselves, which makes them very different from the majority of such establishments. Needless to say, it was doing very good business. From Sant’Eustachio we walked to Piazza Navona, again more photos of what is undoubtedly my favourite piazza. There is so much going on there, with the artists and caricaturists, all extremely talented people. What I found irresistible though were the people who were imitating still life. 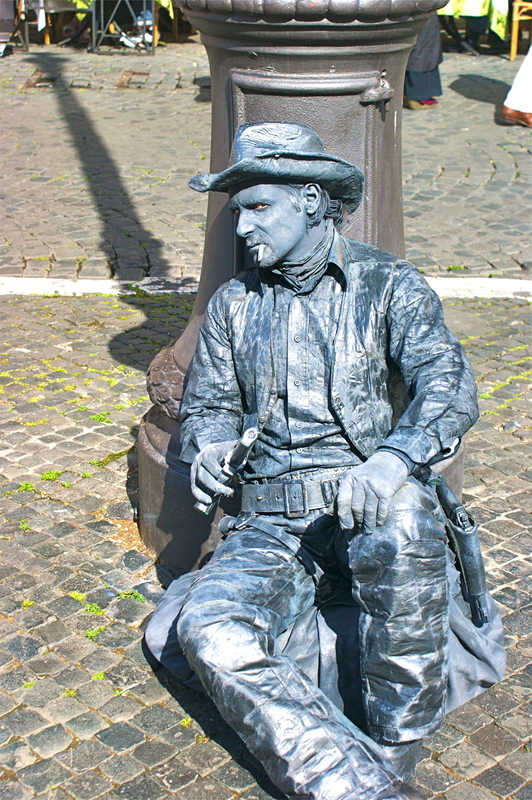 There was a young lass standing stock still balancing a goldfish bowl on her head, someone else dressed up as a mummy, again without the merest hint of movement, a cowboy all done up in grey, who did point his water pistol at me when I took his photo! 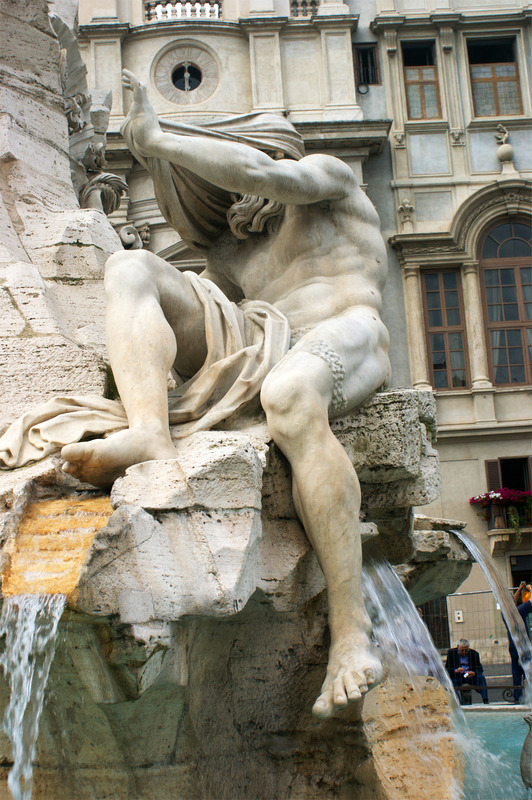 But the weirdest one was sitting on a chair by the Fontana dei Quattro Fiumi. This character had no head, but did have a body and a hat on! Sitting totally still, it then suddenly lurched out of the chair in a way that most definitely was not an animatronic movement; it then sat back down and shuffled its feet before becoming still again. So weird, and it had a few people looking a bit glazed, laughing somewhat nervously! Me? I had a fit of the giggles!! From Navona we walked to Campo de’ Fiori, stopping off to grab a panino. And when I say panino I mean a PANINO, made up of porchetta in a great slab of foccaccia bread. We also stopped at a bar, for a bit of liquid refreshment. This meant that we were a little late arriving at the Campo, and found they were well into the process of packing up. 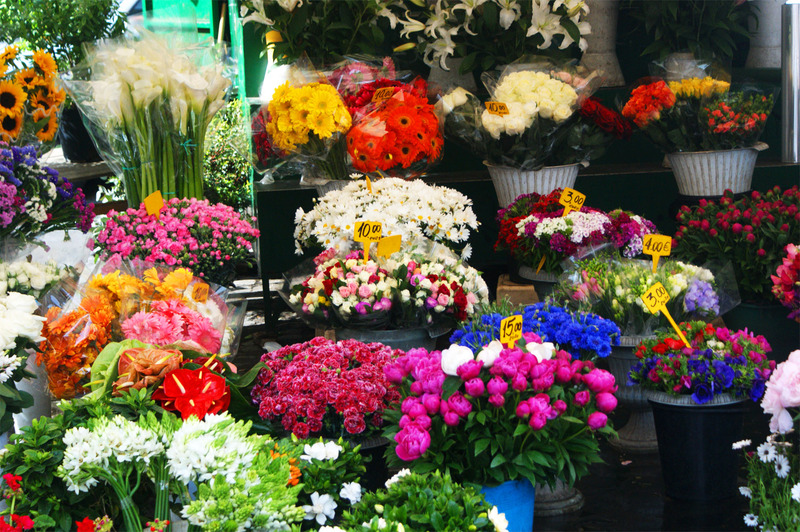 There was enough time to take a couple of photos of the flower stalls and then we left, determined to return at a time when the market would be buzzing. The afternoon was now well advanced and there was still plenty to see. 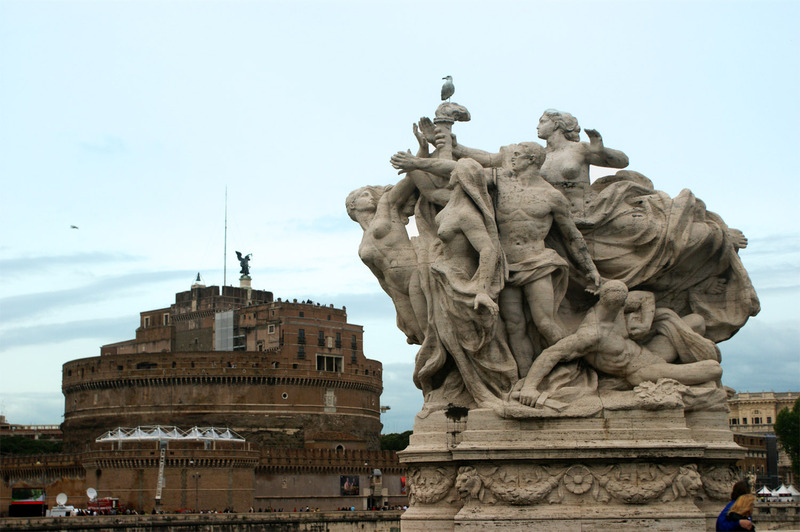 We crossed the Tiber at the Ponte Sisto and walked along Lungotevere towards Castel Sant’Angelo. 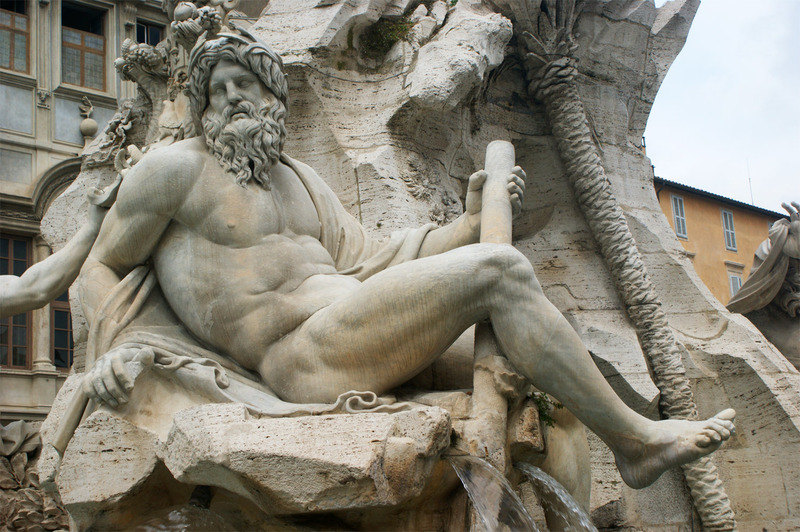 We then walked over the Ponte Vittorio Emanuele, which has the most incredible statues. I simply had to take photos of one or two, particularly with the Castel in the background. Rick then showed me where his office was, in Via Paola, before we crossed Ponte Sant’Angelo to see where we could get a good glimpse of the Mille Miglia. As we were somewhat early we walked back over the bridge and after a while found a promising restaurant, called Etablì (http://www.etabli.it/). It was good to sit down, even if it was on my spectacles! Which did not do them much good!! And the atmosphere was just fantastic. If you enter the website you will get a taste of the marvellous jazz that is played in the lounge. 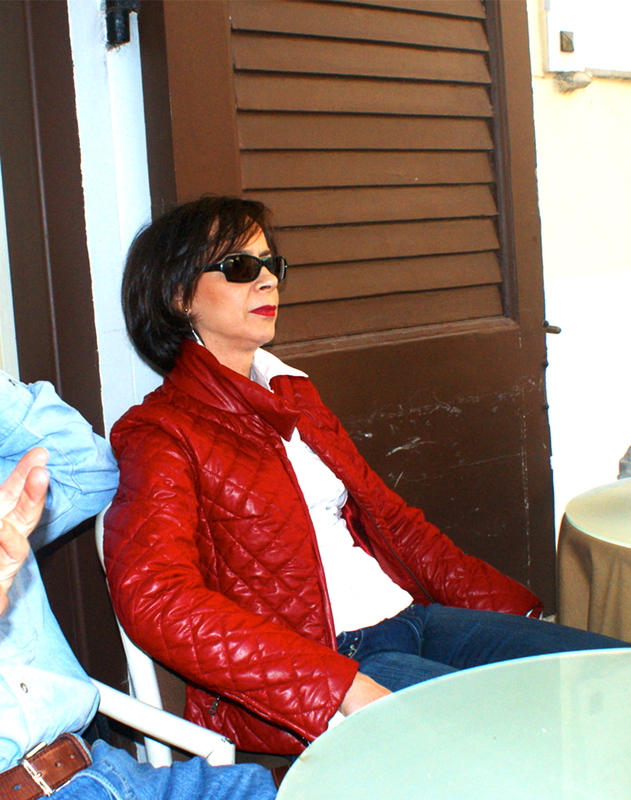 We were able to relax with a very nice red wine, and were pleasantly surprised when Lorenza telephoned Rick about the next day, when we would be travelling down to Baia. Fortunately, we were able to get a table and ordered dinner. I had a fish dish, followed by their special take on Tiramisu – enough to really pick me up! I had a Nero d’Avola wine that made all the Nero d’Avolas I’ve had in the past seem totally naff. THIS Nero d’Avola was most certainly a wine to die for, again and again and again. After having had dinner we went across Ponte Umberto and made our way towards the Castel Sant’angelo to see the cars taking part in the famous Mille Miglia arriving. I managed to take a few photos – the better ones I took further away from the crush. We then took a taxi to Piazza Buenos Aires, where Rick introduced me to Lemoncoco – lemon juice and coconut, very refreshing. Then it was back to apartment to crash out!